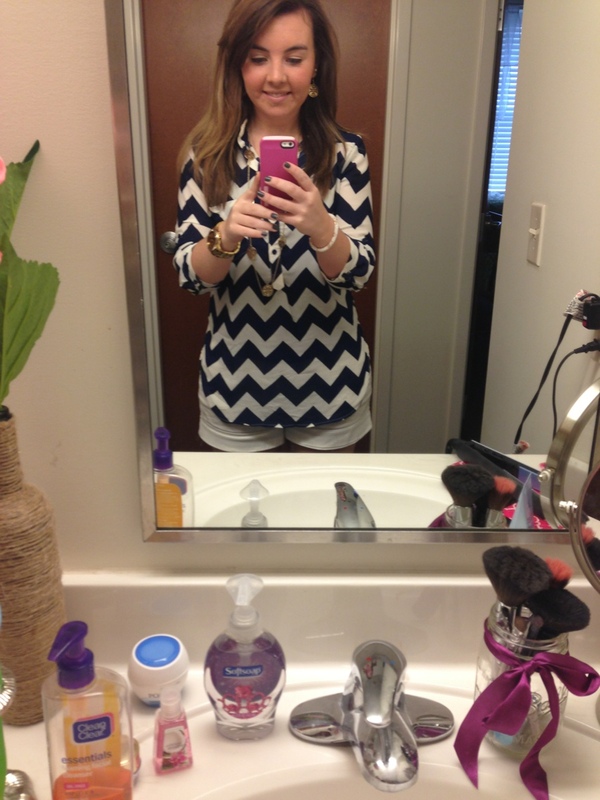 Normal college students wear shorts and a t-shirt or sometimes just pajamas. However, because I'm a fashion merchandising student I usually dress up. But I only dress up on the days I have fashion classes haha. On a normal day when I dress up I like to wear white shorts and a nice top, but I stick to the Labor Day rule so I can't anymore. The shorts are from Cato. 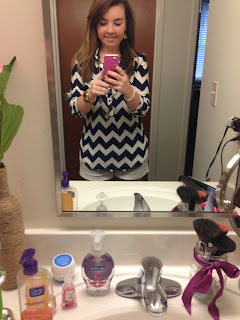 My navy chevron top is from the boutique that I worked at all summer. 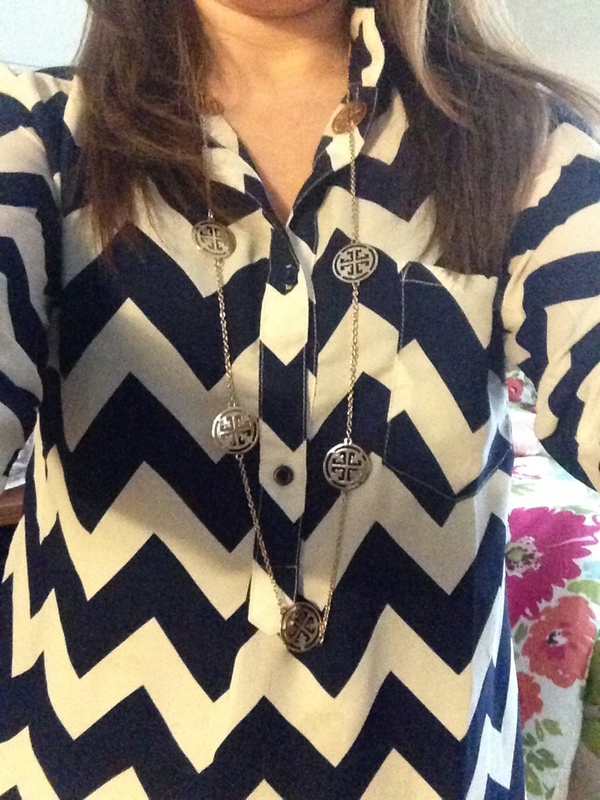 I got the Tory Burch knock off necklace from Madison, a boutique in Raleigh, NC located in Cameron Village. 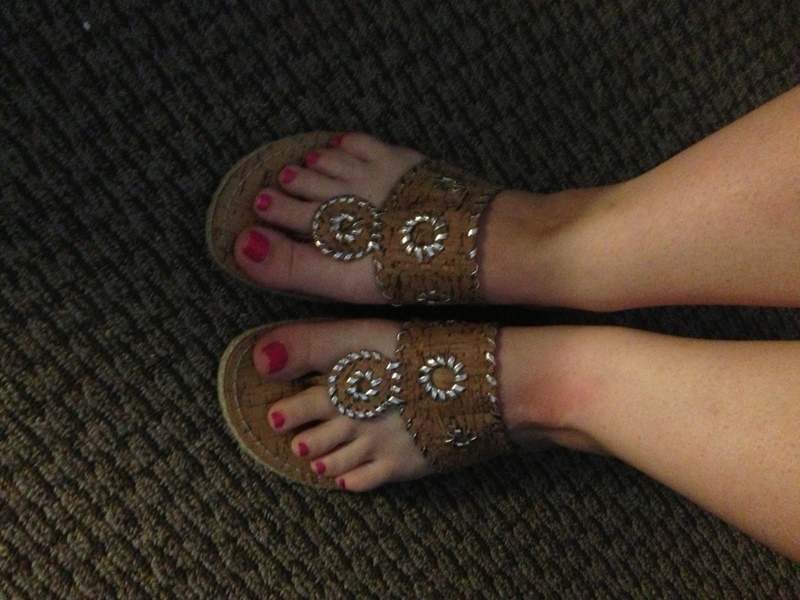 I own real Jack Rogers in black and silver, but not a gold pair. I got these from Rack Room a few years back. 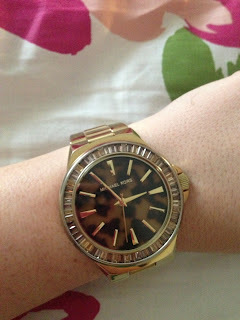 For jewelry I wore my Michael Kors watch I got for christmas, I wear it almost everyday. And lastly I wore my beloved Alex and Ani braclets. I got them from the boutique that I worked at this summer but you can get them from any Nordstrom. These braceletes are charm bracelets but you can not put charms on them, they stack. I got the tiara bracelet the day the royal baby was born, not on purpose. The "Because I love you" bracelet was from my boyfriend. The mermaid I bought on my own. And the Sailboat and Sister bracelet were from my mom and brother for my birthday. 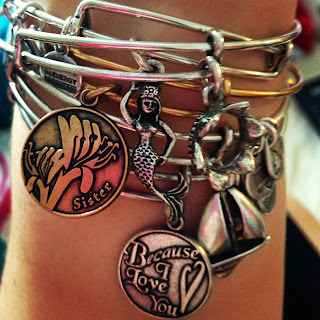 Every bracelet comes in either gold or silver but all of mine are silver except the sister bracelet. 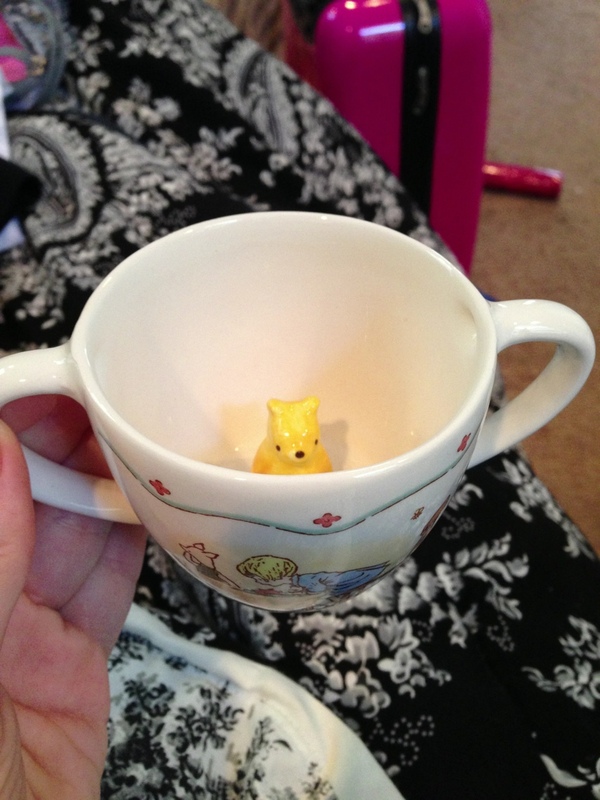 How cute is this precious Winnie the Pooh Disney tea cup?! I found it at a local yard sale and it has a secret Winnie the Pooh hiding in the bottom to be found when the drink is done. I found this ADORABLE silk bow with vintage pin at the flea market. 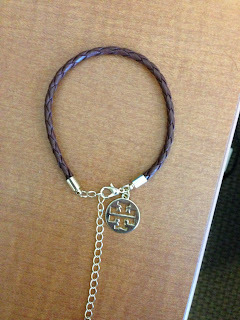 I am in LOVE with Tory Burch and I instantly had to have this bracelet when I saw it. It was only 5 dollars at the flea market. 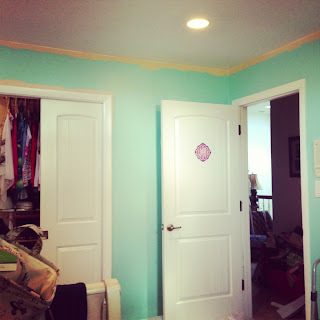 I have always wanted to paint my room, it was a peach color for as long as we've lived in our current house. However, I happen to have the heaviest furniture known to man, or atleast known to me. 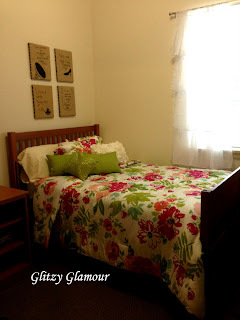 Both my sleigh bed and big desk are from Pottery Barn kids a few years back and they are made of super thick white painted wood. 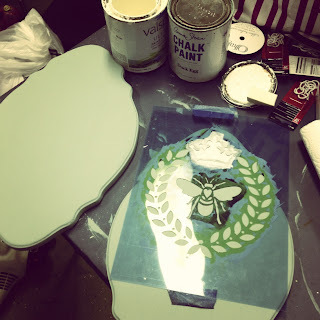 I decided I would paint everything and then move my furniture just enough to get behind to paint and then put them back, with the help of my boyfriend of course. I bought this gorgeous frame from Hobby Lobby on sale. 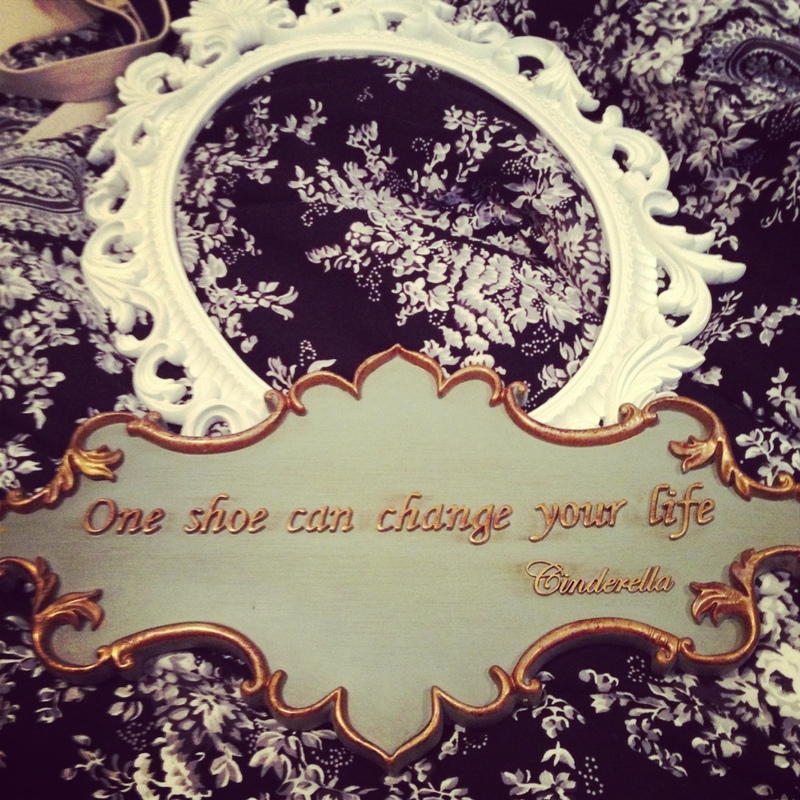 The plaque is my favorite part of my whole room, I found it while thrifting and fell in love, I equally love fashion and disney a great deal so I had to have it. And here is my new Tiffany walls! 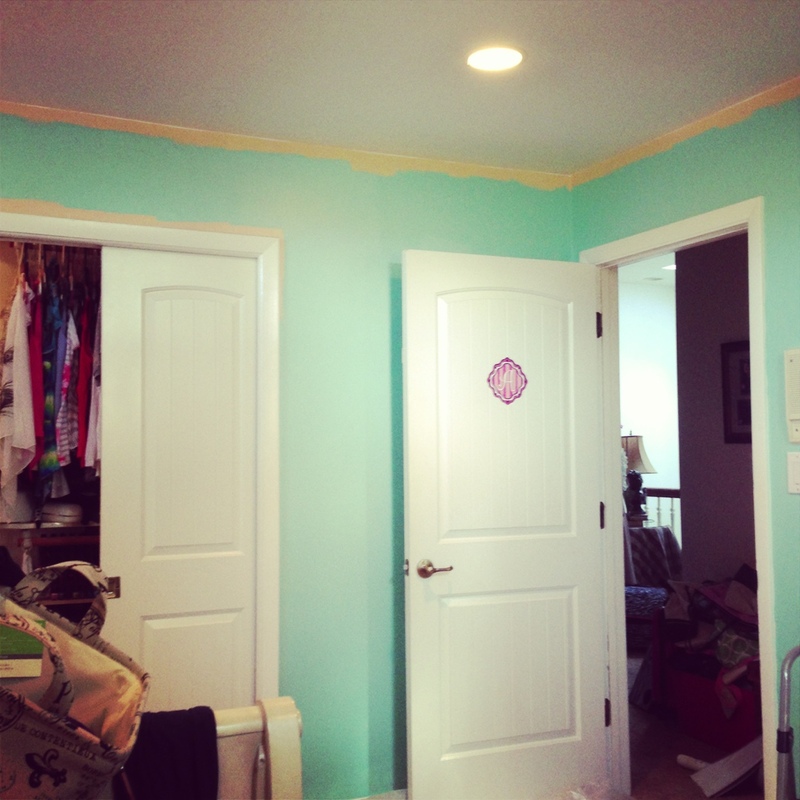 Not sure what the color is specifically but its just as close to Tiffany Blue as I could get at Sherwin Williams. 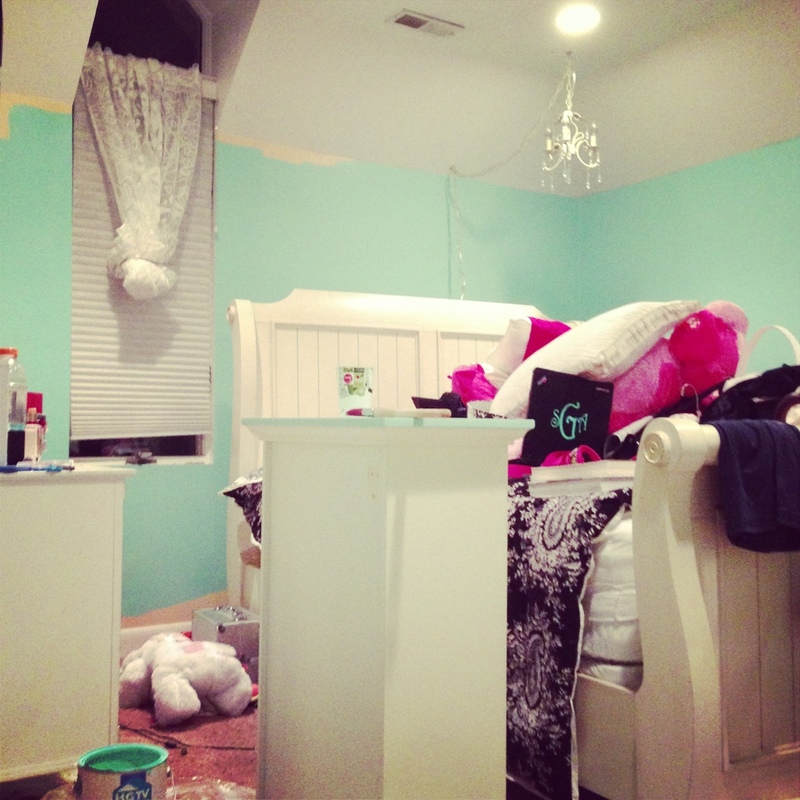 The mess that comes with painting a room with furniture in it already. I had a red chair and mirror table at the end of my bed. 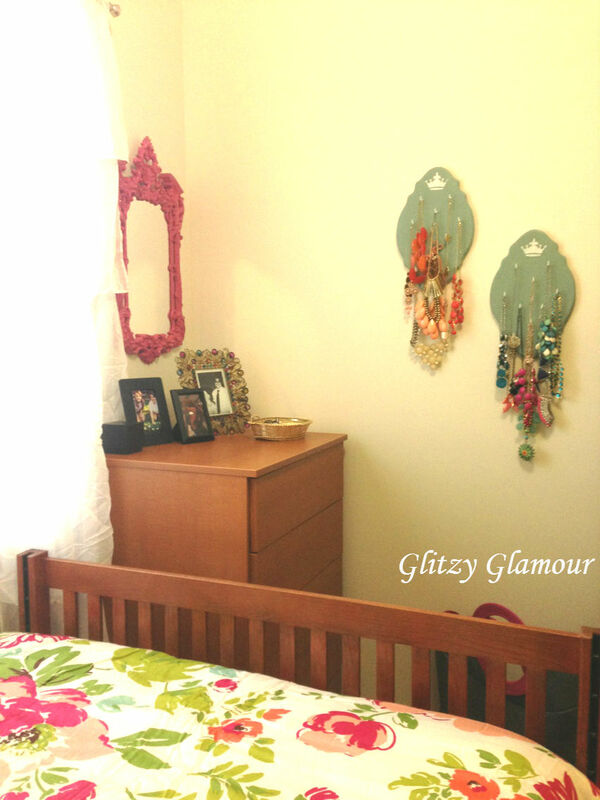 I traded the chair out for my mirror that holds jewelry inside. My mirror was against the wall between my bathroom door and bedroom door but it was always in the way because it comes out so far. I decided that if I put it in the corner than I would be able to dress better and have easier access to my jewelry. On my mirror table I have a Tiffany box that my Tiffany cup came in, my Tiffany cup, and some old vintage things. The top of my nightstand had been dirty from water damage from leaving cups on it and nail polish remover had taken some of its finish away. 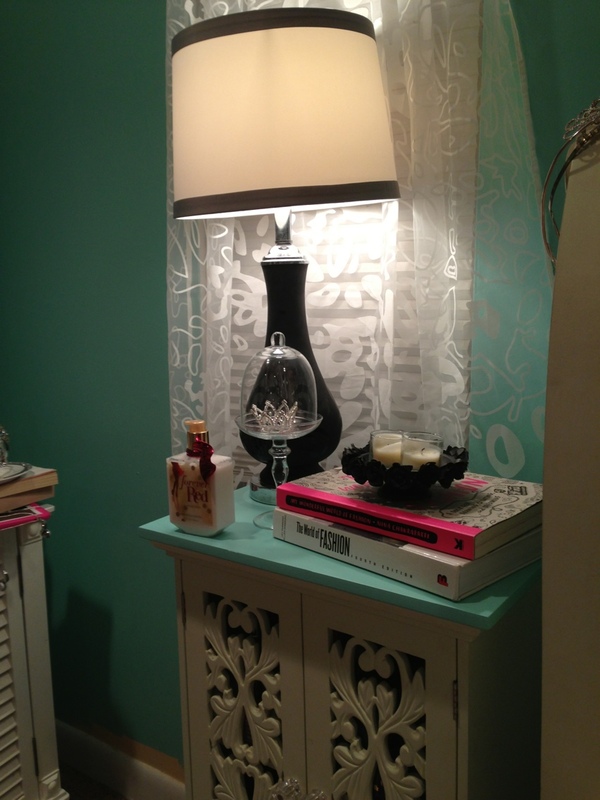 I painted it with my wall paint and put my old lamp and some fashion books on it. 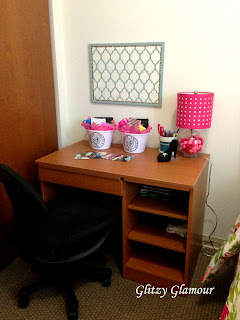 I really like to craft and be creative so I decided to do some for my room. 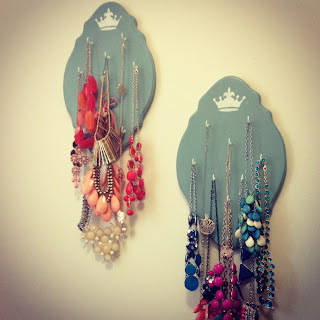 I kept seeing jewelry holders all over pinterest but didn't see any I particularly liked. I thought about it all summer and finally thought of a way to show my necklaces and actually match my room. I went to Wal-mart and got wood pieces from the craft section. I painted them Duck Egg blue from the Annie Sloan Chalk Paint collection and stenciled a crown with simple white craft paint. The white hooks in the corner of the picture were super difficult to twist in but I got them in and they work great for necklaces. 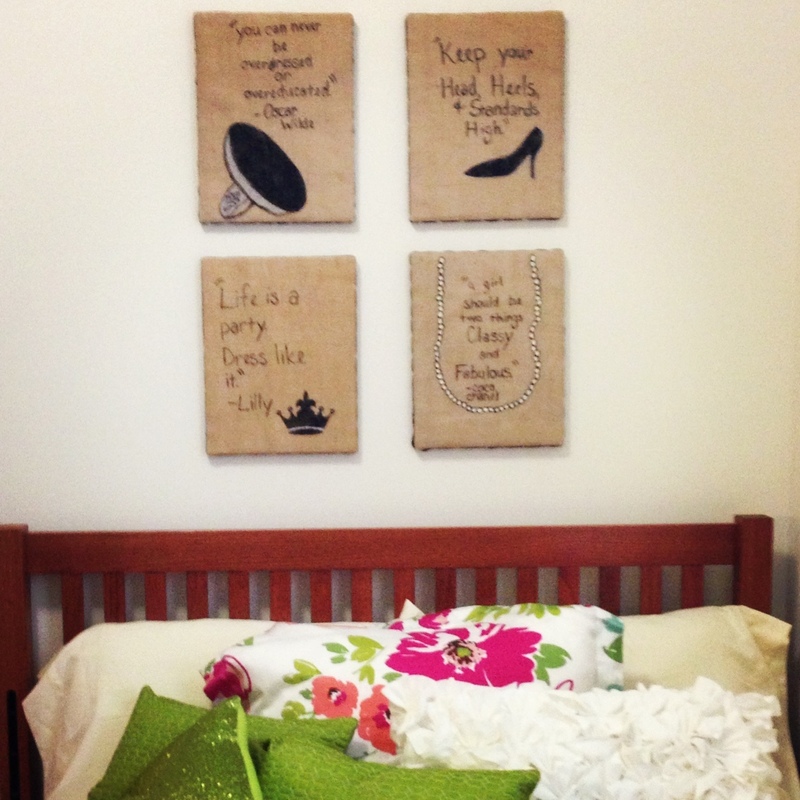 The canvas below was inspired by a pinterest find. 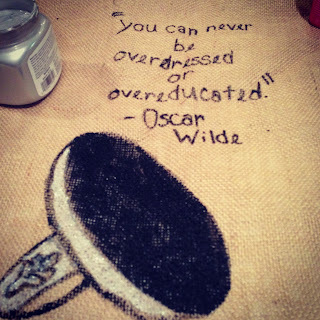 I copied the quote and pearls that someone had painted on a canvas from pinterest. 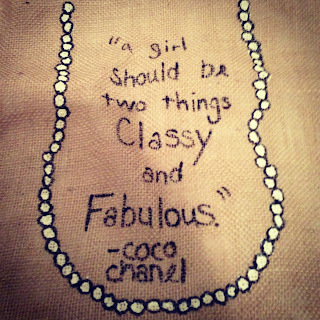 The burlap however was my idea. The canvas on pinterest as painted tan but I covered my canvas with burlap and then painted the quote and pearls on the burlap which was not easy. I painted the canvas not knowing where I was going to put it. My mom had a great idea that I should make three more to match and use over my bed. The people that lived in our apartment before us left cabinets full of empty wine bottles. I almost through them all away but I decided to keep a few in case I came across a way to use them. 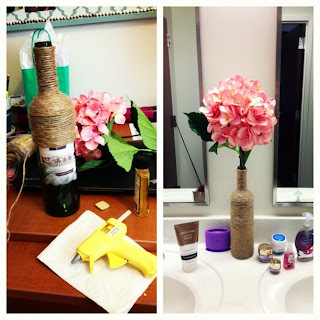 I found a picture online that showed wine bottles wrapped in twine. 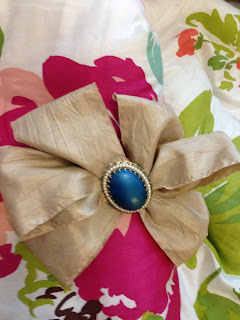 I wrapped it in twine that I found at Dollar Tree and glued it in place with my glue gun. I now use it as a vase for a fake hydrangea I found in the flower section in Wal-mart. 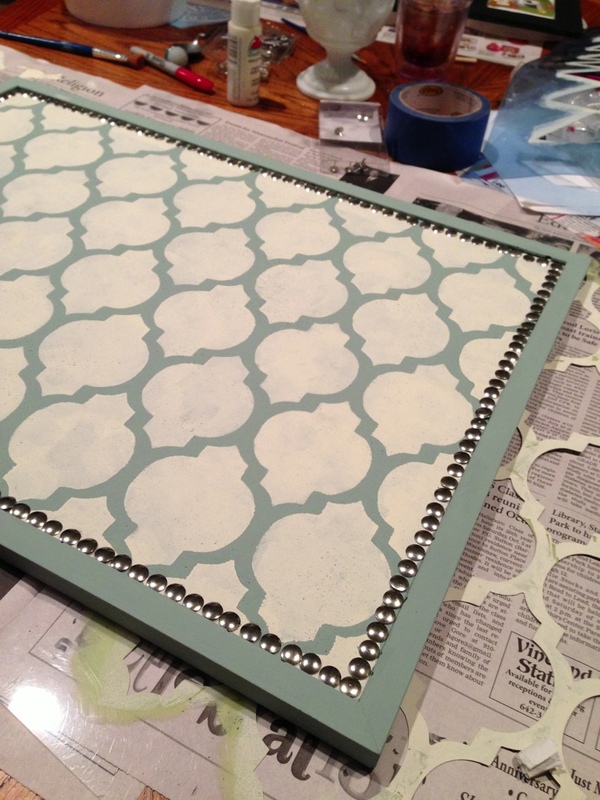 Last but certainly not least, I took a normal bulletin board from Wal-mart and painted it the same Duck Egg blue that I painted my necklace holders. 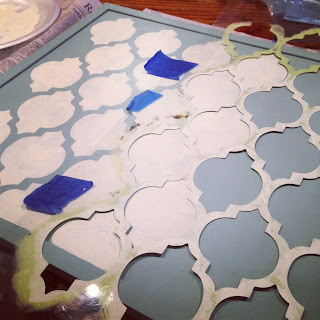 I got a packet of stencils from eBay and used the one the picture to stencil a design with white craft paint. 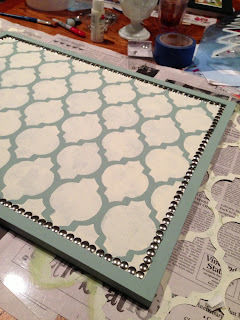 After it dried I used silver thumbtacks to make a shiny border that gives the look of upholstered furniture. The college I attend doesn't allow the students to live off campus or in the campus apartments until a student has atleast 60 hours (considered a junior). It is my third year in college and I have earned 60 hours so I finally earned the right to move out of the dorms, best part of being a junior! 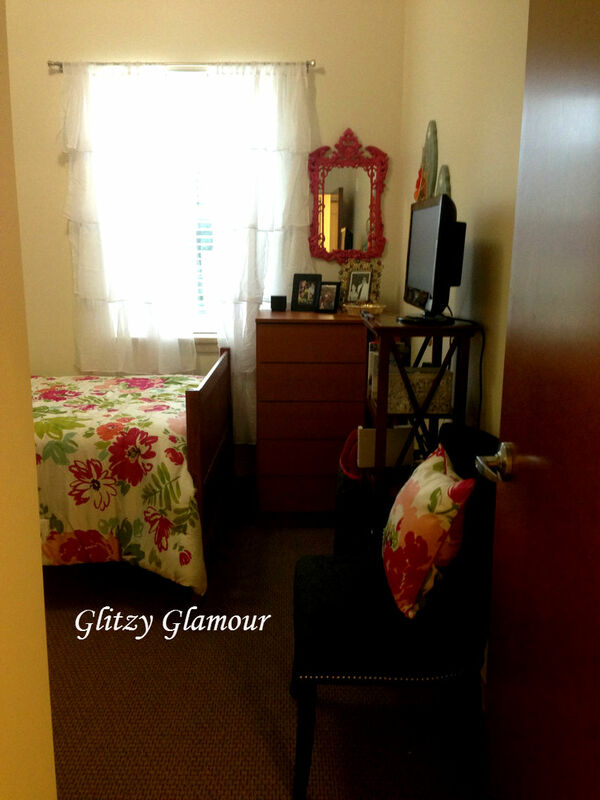 haha I didn't move very far, however, I moved to the apartments on campus but I love it. 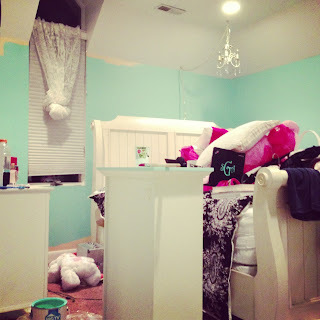 But enough of my life story, it's time to see my room! The view when you come in, the room came equipped with a bed, dresser, a rolling desk chair, and desk. 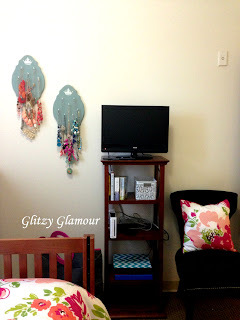 I brought my black chair that I used as a desk chair last year, an old shelf from Pier One Imports that once sat in my room at home, a TV, and other decorations. The blue plaques are necklace holders that I crafted so I could have easy access to my jewelry and display them. 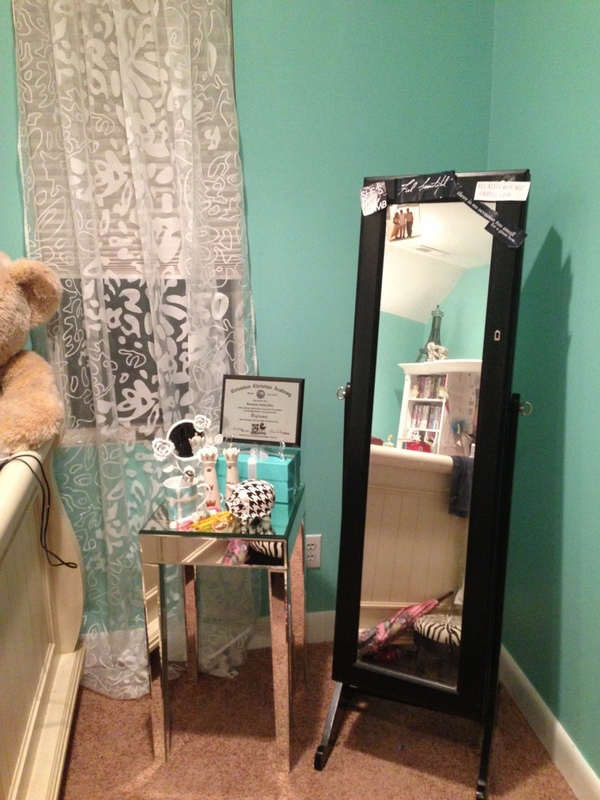 My pink mirror is my favorite decoration in my whole room. My mom found it while thrifting. 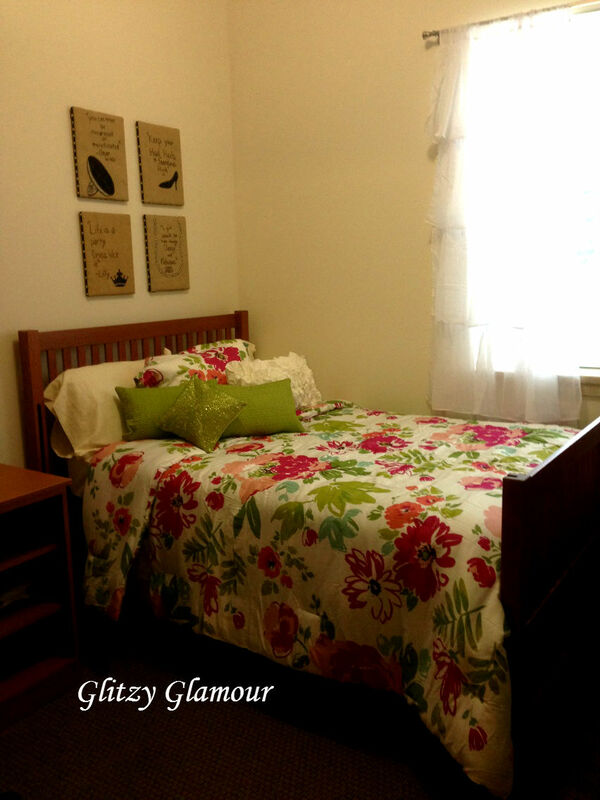 Someone had painted an old plastic mirror a hot pink color which matched my bedspread perfectly. My bed spread is a little on the wild side, especially for me. 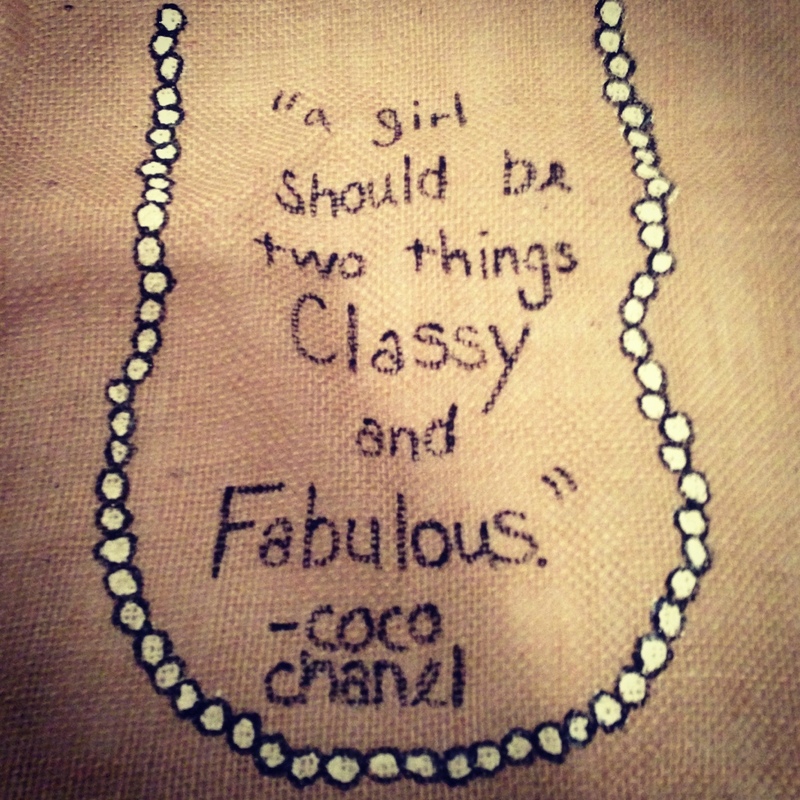 I'm very flashy when it comes to what I like and what I wear but I have a more mature approach to it. 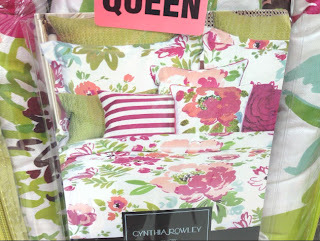 However, this Cynthia Rowley bedspread is a little more juvenile that my taste, but I love it. I got it from Marshalls for around seventy dollars. My favorite part about it is that it matches everything because of the many colors in it. Lastly is my desk, I decided to keep the ugly rolling chair mainly because I don't have anything else to do with it. I painted the bulletin board on the wall and brought back my lamp and shoe tape dispenser from my dorm. Ignore the buckets, they were my presents to my littles.